"Sci-fi first-person shooter computer game for Windows"
Since the introduction of Doom back in 1993, first-person shooter video games have become very popular because they deliver a huge amount of fun and action and put you right in the center of it. If you love this kind of games, then you should try this one. 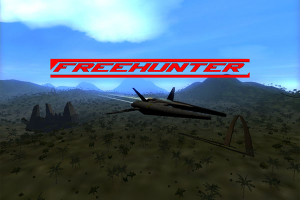 FreeHunter is a FPS computer video game that brings you a complete war experience: you do not just fight on the ground as infantry, but you can also ride a jeep and even pilot a fighter aircraft. FreeHunter features high-quality 3D visuals and animations, and the fact that it doesn't fill your screen with lots of stats, a minimap and messages improves the visual experience. As in most war games, you will be able to use different weapons, and as mentioned: there are also war vehicles that you will have to ride in some levels. FreeHunter is not as sophisticated as modern war games like Call of Duty for example, but it does deliver more than enough thrilling action and effects.